(German-Style Marzen) and The Regulator (Doppelbock). 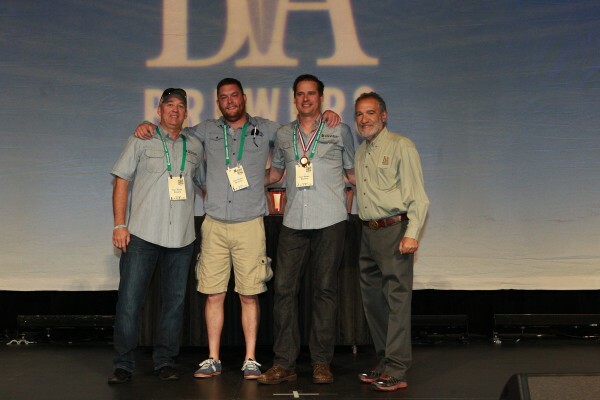 903 Brewers: Silver for 2014 Sasquatch (Aged Beers). 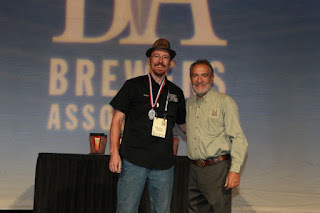 Panther Island Brewing Company: Silver for Allergeez (Herb/Spice Beers). 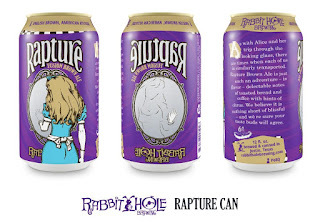 Rabbit Hole Brewing Company: Silver for Rapture Fusion Brown Ale (American-Style Brown Ale). Twin Peaks Brewing Company: Bronze for Barrel Aged Brown Ale (Wood/Barrel-Aged Beers). Looking over the list, some may be surprised to see a certain chain restaurant make the cut, but it should probably be noted that company brewmaster Thomas Janik brewed for 17 years at Humperdinks before taking the reins at Twin Peaks. In other words, it's not the guy's first rodeo. 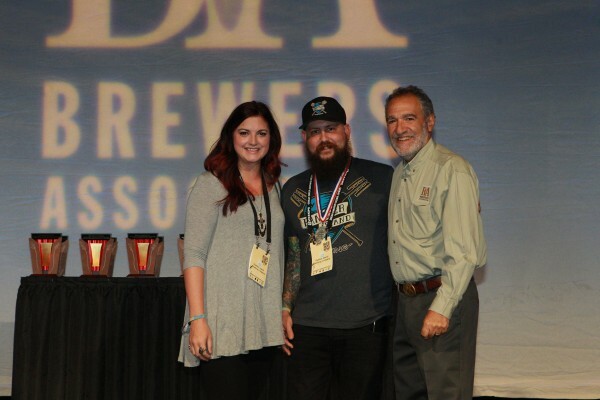 During his time at 'Dinks, the brewpub won 10 medals at GABF for the execution of various recipes developed both in-house and at the corporate level (Humperdinks partnered with Big Horn Brewing up until 2005). As for the other medalists, while Rahr & Sons was a repeat winner, Twin Peaks and the other three breweries listed took home hardware for the first time. While this surely won't quiet down the armchair experts who claim that only a handful of breweries make quality beer in North Texas, the fact is that 11 different local breweries have now won medals at either the GABF or the World Beer Cup over the past three years (click the GABF/WBC Honor Roll tab at the top of the page to see a complete historical list). Awards don't mean everything, of course, but to me the results indicate that more than just a few breweries are producing good beer in the region right now. Given that, I fully expect to see more first-time winners from the Metroplex in the years to come. While we've seen some notable new build-outs (Grapevine, Lakewood) in North Texas, as of now nothing here at home quite compares to new facilities recently opened by three well-known Colorado brewers. Avery Brewing Company's new $30 million/67,000 square foot space opened in February and is a considerable upgrade compared to the one the company previously called home in a nearby Boulder business park. The new building has a taproom on the ground floor, while the upstairs has a full-service restaurant and a catwalk which allows visitors to peer into various aspects of the production area. It sits in the Gunbarrel section of Boulder County, literally steps away from the relatively diminutive Asher Brewing Company, which is the first all-organic brewery in Colorado. areas and the wall of the taproom (click to enlarge, © Brian Brown/Beer In Big D). Opening in June, Breckenridge Brewery spent a total of $36 million to develop their new farmhouse brewery in Littleton, just south of Denver. In addition a production and storage space comprising 76,000 square feet, the expansive site also contains the Farm House restaurant. There, they serve a "Colorado Fresh" menu and pour beer from 24 taps. Among them are 16 house selections and another 8 from guest breweries. Left: Breckenridge Brewery's production and storage buildings. Right: The tapwall inside the Farm House restaurant. At least in terms of the initial phase, Great Divide Brewing Company's new digs in the River North section of Downtown Denver is the smallest of the three large-scale breweries I visited. Then again, the 65,000 square feet in question doesn't include brewing operations. Such things will come later as part of an overall expansion plan expected to cost a total of $38 million. Right now, the building which opened in July is a packaging/warehouse facility with an attached 40-seat taproom called Barrel Bar. It's a short walk to both Crooked Stave at The Source in one direction and a newbie by the name of Mockery Brewing in another. 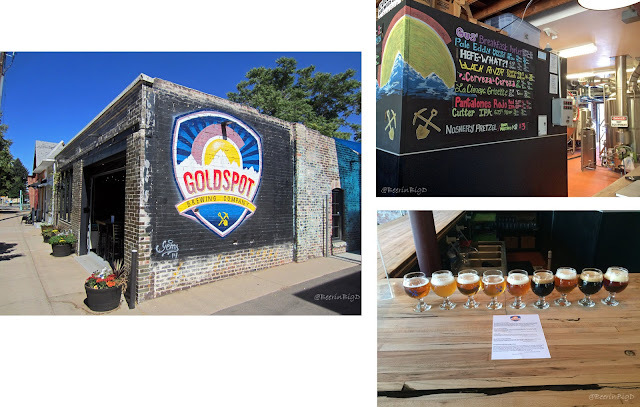 Among the smaller, lesser-known breweries I visited on this trip was Goldspot Brewing Company. Located to the west of Downtown Denver, the brewery opened earlier this year after being founded by Matt Hughes and brother-in-law Alex Sward. Hughes hails from Lancaster, Texas, where he still has family, and I actually came to know him through social media where he keeps up with the North Texas beer scene. He left the Lone Star State in 2005, eventually going on to work for Wynkoop in Denver before taking on his current project. (click to enlarge, © Brian Brown/Beer In Big D). 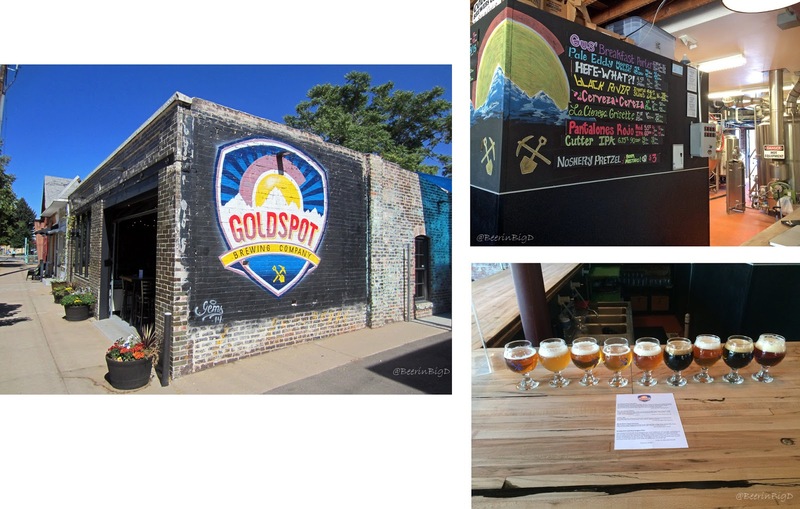 Goldspot's portfolio consists of a mix of styles, including beers of American, German and Belgian influence. Among the highlights are Gus' Breakfast Porter, brewed with cold-pressed coffee and dry-hopped with cocoa nibs, Wolfpack, a fresh hop Belgian pale ale, and La Cienega Grisette, an imperial farmhouse ale. Really, though, there wasn't a bad beer among the nine that were on tap the day I stopped by, with each being an embodiment of the brewery's goal to produce "properly made beer." Cherry Busey, a Flanders oud bruin from Sun King Brewing in Indianapolis, Indiana. Cone Flakes, an imperial IPA from Firefly Hollow Brewing Company in Bristol, Connecticut. Farm to Face, an American wild ale from Allagash Brewing Company in Portland, Maine. Quad Damn It!, a Belgian quad from Chicago Brewing Company in Chicago, Illinois. Recalcitrant Dockhand, a robust porter (get it?) from Black Star Co-Op in Austin, Texas. Bacon Bomb, a rauchbier brewed with beechwood and cherrywood smoked malts, chocolate wheat and black pepper from Brenner Brewing Company in Milwaukee, Wisconsin. Bourbon Barrel Aged Palo Santo Marron, a barrel-aged imperial brown ale from Dogfish Head in Milton, Delaware. Bramble Berry Bourbon Barrel, a spontaneously fermented wild brown ale from New Glarus in New Glarus, Wisconsin. Morning Wood, an imperial maple bacon coffee porter aged in bourbon barrels from Funky Buddha in Oakland Park, Florida. Oatmeal Raisin Cookie, a beer that tastes just like it sounds from Aftershock Brewing Company in Temecula, California. Lakewood Brabo's Reserve - this version of the brewery's 2013 entry in their popular Legendary Series was aged in a Lost Oak Winery Petit Verdot barrel. Simply put, this beer has never tasted better. Most curiously-concocted beers: Scratch Brewing Company in Ava, Illinois. This farmhouse brewery produces the Single Tree series, which consists of beers made with various parts of, you guessed it, trees. Ingredients include acorns, bark, branches, leaves and more. One beer, Single Tree: Maple, forgoes water entirely in favor of tree sap. Most curiously-named brewery (and location) on the festival floor: Lickinghole Creek Craft Brewery in Goochland, Virginia. It sounds made up, but this farm brewery lies alongside Little Lickinghole Creek, a waterway where wildlife have stopped to drink since pre-colonial times. As for where it's located, former Virginia governor Sir William Gooch named Goochland County after himself in 1727. The City of Goochland is the county seat. Favorite brewery from outside Texas: Fremont Brewing of Seattle, Washington. Makers of The Lamb (Brett saison aged in Chardonnay barrels), Bourbon Barrel Aged Dark Star (oatmeal stout), Bourbon Barrel Abominable (winter ale) and Cinnamon Bourbon Barrel Abominable. This family-owned brewery has been around since 2009, but according to my notes I had never sampled Fremont's products previously. Based on the above four beers, though, it's a safe bet the brewery will be a must stop on into the future. Images the property of Texas Ale Project. Becoming the latest North Texas brewery to make the move to packaged products, Texas Ale Project (T.A.P.) has revealed the company will begin canning operations in November 2015. 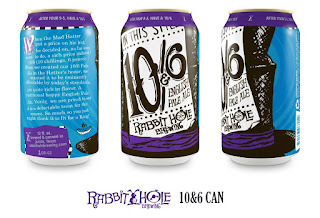 "We are constantly being asked when our craft beers will be available for take-home purchase" says Kat Thompson, the brewery's president and CEO, "so we are incredibly excited to offer our ales in cans." The timing of the move will coincide with T.A.P's first anniversary, which according to the brewery puts the plan's implementation three months ahead of the originally projected schedule. "This has been an incredible year of growth for us, and launching our ales in cans is the obvious next step" added Kat's husband and co-founder Brent Thompson. Product design was done in partnership with Saputo Design and Speck Communications. Using color block styling and subtle humor, the intent was to have the label design match the assertive, yet smooth nature of the beers they represent. Initially, the brewery will release Fire Ant Funeral Amber Ale and 50 FT Jackrabbit IPA with packaging being done by Armadillo Mobile Canning. However, a press release indicates T.A.P. is also working on plans to install an on-site canning line in their Dallas production facility late next year. 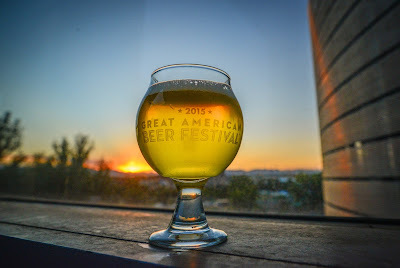 Image credit: Grapevine Craft Brewery (click to enlarge). Craft beer for a cause is something that's becoming more and more prevalent not only nationally, but also here in North Texas. As further evidence of that, Grapevine Craft Brewery is releasing a new fall seasonal in support of local firefighters with the accompanying label text, "Giving back to the Grapevine community is not just a part of our mission statement, it's a commitment." 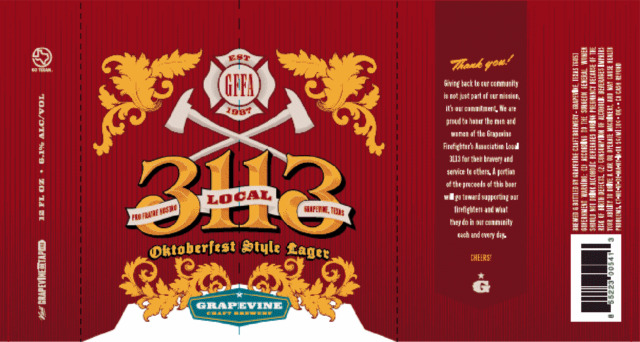 Local 3113 Oktoberfest Style Lager is set to launch on draft and in cans with a portion of the proceeds from all sales going to the the Grapevine Fire Fighter's Association. Described as "bigger and bolder than the traditional märzen," the beer is said to have "deep maltiness backing a strong, but balanced hop character and a clean, dry finish. It's the perfect festbier to welcome the coming of fall." According to a press release, Grapevine will unveil Local 3113 at a mini-Oktoberfest event to be held at the brewery's Taproom and Beer Garden on September 26. Running from noon to 3 p.m., the festivities will include live music and German fare provided by AJ's on Main. Fire trucks will be on site as well, with members of the Grapevine Fire Fighter's Association present to greet and thank the community for their support. 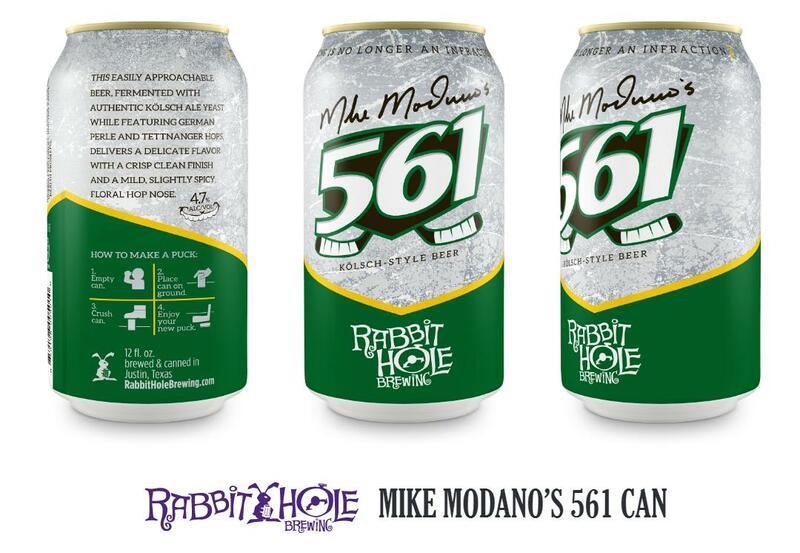 Image credit: Lakewood Brewing Company/Guns & Hoses Foundation. In the days ahead, followers of the Lakewood Brewing Company will have an opportunity to preview a new beer that won't be produced for wide release until March 2016. All Call, the brewery's new Kölsch, is "dedicated to the hard work and dedication of police and firefighters everywhere." 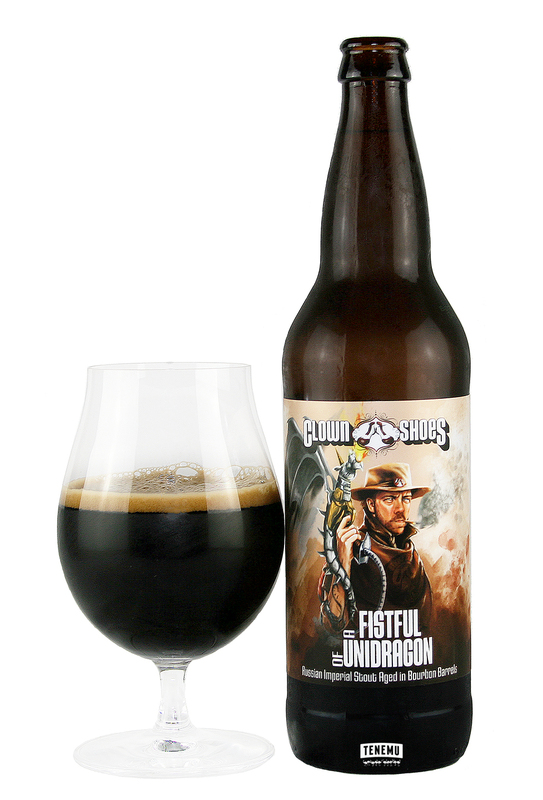 In that spirit, a portion of the proceeds from the sale of this beer benefit the Guns & Hoses Foundation of North Texas. This organization supports the families of fallen police and firefighters and Lakewood is proud to be the group's official beer sponsor. On Saturday, September 19, the foundation will host the 14th Annual Guns & Hoses Boxing Tournament at the Allen Event Center. All Call will be served, and fully 100% of the funds raised at the event will be donated to the benevolent fund, which provides monetary assistance to families of first responders who sacrificed their lives in the line of duty. Tickets for event are available at the following link: (Click here). For those not able to attend, All Call will also be available on a very limited basis on draft at the 2015 State Fair of Texas. Following an earlier announcement on social media, Rabbit Hole Brewing Company has released additional details on the upcoming debut of the company's products in cans. "The demand for locally-brewed craft beer is higher than ever. To help bring unique flavors and one-of-a-kind tastes to beer enthusiasts across the Dallas/Ft. 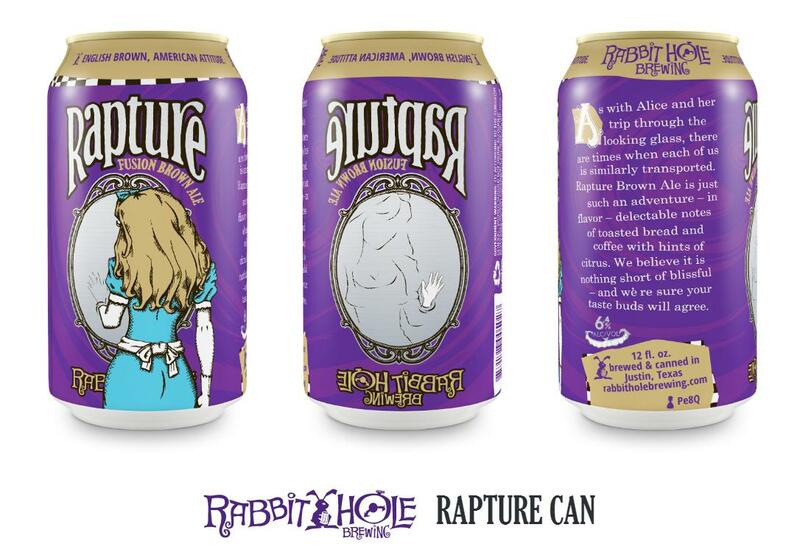 Worth Metroplex and surrounding areas, Rabbit Hole Brewing is excited to offer 12-ounce aluminum cans in select varieties. 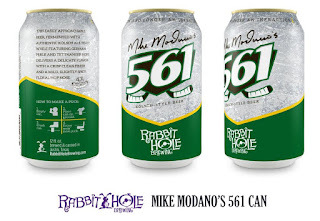 Beginning October 2015, beer fans can find three of their favorite Rabbit Hole flavors on store shelves in the new packaging." Varieties and distribution dates are given below with full views of the product packaging (click each image to enlarge). Images courtesy of Deep Ellum Brewing Company. 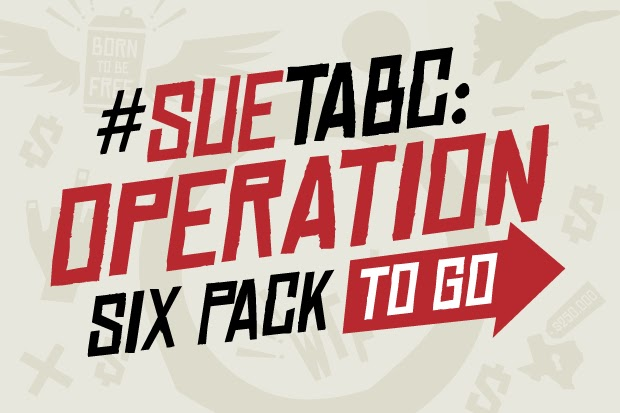 Today, Deep Ellum Brewing Company of Dallas has launched “Operation Six-Pack to Go,” a crowdfunding campaign on Indiegogo to sue the State of Texas in a battle to abolish unfair laws that impact microbrewers. According to a press release, Deep Ellum has set a goal to raise $100,000 to fund their initiative to force the State of Texas to change the current law. 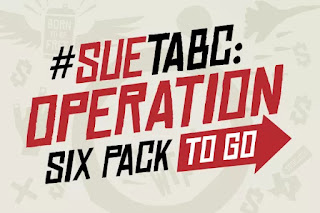 The injustice in question is the unfair and unconstitutional laws that prohibit microbreweries from selling their products on-site for off-premise consumption, most notably six-packs. 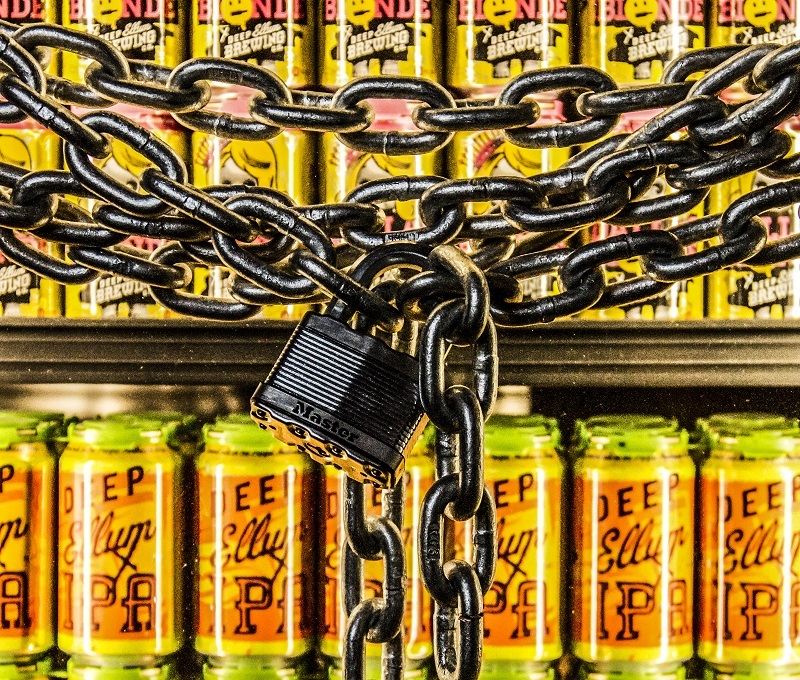 “Texas allows every other alcoholic beverage manufacturer – wineries, distilleries, and even brewpubs to sell their products directly to the end consumer for off-premise consumption,” said John Reardon, founder of Deep Ellum Brewing Co. “Microbreweries cannot, and that’s not right. The alcoholic beverage laws in Texas have served special interests, protecting private, rather than public welfare, and it’s time for a change." 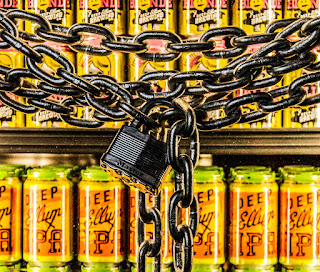 Help set the beer free. As to why the brewery chose crowdfunding as a way to finance the project, Reardon believes this is a consumer interest lawsuit where the rights of all citizens of Texas (and visitors from beyond) are being unlawfully stifled. “Lawsuits are expensive and we want to make sure we can see this through to a favorable outcome,” added Reardon. "Crowdfunding sends the right message because it comes from the people. It's a way for everyday citizens to pool together the resources needed to challenge powerful lawmakers and deep pocketed lobbyists." Image credit: Historic Downtown McKinney. Nothing says Oktoberfest in North Texas like the ceremonial tapping of a 200 year-old keg by Franconia brewmaster Dennis Wehrmann. 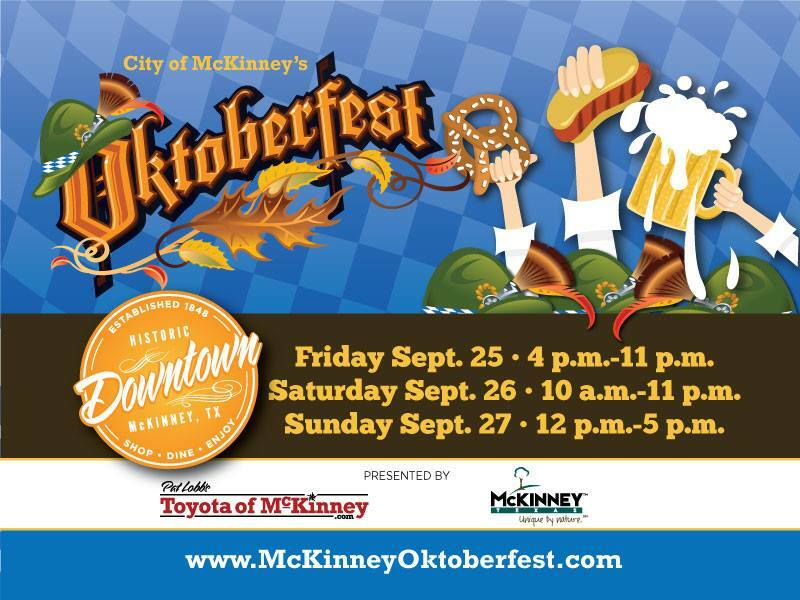 This annual occurrence marks the opening of McKinney Oktoberfest on the city's downtown square, and this year it will be no different. What will be different, though, is that Franconia won't be the only brand of beer being served at this year's festival. For 2015, McKinney is bringing in additional Oktoberfest offerings from breweries in Texas and Germany. Not only that, Tupps Brewery will be on hand for the first time after opening earlier this year in the host city. Along with a handful of year-round beers, Tupps will be pouring a new pumpkin-inspired seasonal called Tuppkin' Ale. 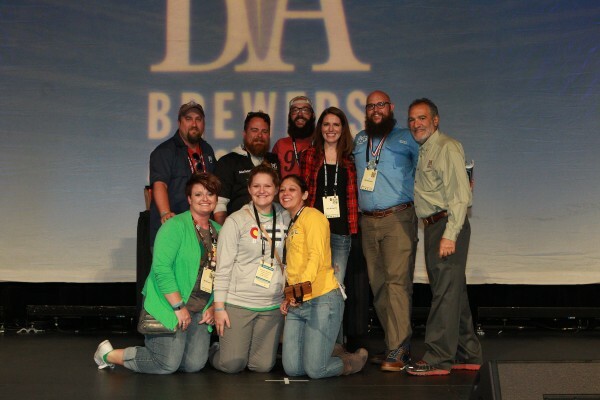 Also on the bill for this year is the Meet the Brewmaster VIP Event, featuring a meet and greet with the folks from Franconia. The cost is $35 (+ fees), which includes a t-shirt, stein, guided sampling and 15 tasting coupons (good for roughly two beers). Tickets for Meet the Brewmaster may be purchased on Eventbrite for sessions occurring on all three days of the festival. Franconia: Kölsch, Wheat, Dunkel and Oktoberfest. Tupps: Black Ale, Cotton Mill Gold, Tupps IPA and Tuppkin' Ale. Texas: Karbach, Real Ale and Saint Arnold. Germany: Hofbräu, Paulaner and Spaten. Images courtesy of Rahr & Sons Brewing Co. This October, Rahr & Sons Brewing Company of Fort Worth will celebrate its 11th anniversary with a series of events at the brewery and a special commemorative beer. Rahr & Sons' 11th anniversary beer will be a Russian imperial stout brewed with toasted coconut. A description of the beer, as it appears on product packaging, promises that the "huge roasted, chocolate and caramelized malt flavors will knock you off your feet as hints of toasted coconut dance on your palate." According to a press release, the beer will debut on tap during 11th anniversary events going on October 23-24 at the brewery. After that, it will be available both on draft and at retail accounts in 22-ounce bottles. Friday, October 23 (7-10 p.m.): VIP beer tasting featuring live music, food trucks and more than 40 different brews. Tickets are $25 and limited to 500, with attendees receiving a commemorative pint glass. Saturday, October 24 (11 a.m. - 4 p.m.): Extended tasting featuring live music, food trucks and additional rarities including an oak barrel of 2011 Bourbon Barrel Aged Winter Warmer and a firkin of Angry Goat aged on chocolate covered banana chips. Tickets are $25 for VIP (500 total, with early access from 11 a.m. - 1 p.m.) and $10 for general admission (1000 total, entry at 1 p.m.), with attendees receiving a commemorative pint glass. Image credit: Lone Star Taps & Caps. Around this time last year, founders Sam and Rick Ali announced plans to expand their Lone Star Beverages empire with the opening of a new growler station in Lewisville. The concept which has come to be known as Lone Star Taps & Caps opened its doors in December 2014, and now just 10 months later the father and son duo is ready to reveal its next move. This fall, Lone Star Taps & Caps will open a second location in the City of Denton. Located at 526 W. Hickory Street, the new spot is positioned halfway between the campuses of Texas Woman's University and the University of North Texas. On top of that, it's just steps away from the city's downtown Square and mere minutes from Audacity Brew House and the recently reported landing spot of Armadillo Ale Works. Given the easy access to these entities and the emergence of Denton as a North Texas craft beer destination, the pair says "it was the right time to bring the Taps & Caps concept to the city." As described in a press release, the new shop will fuse the growler bar elements of the Lewisville location with the convenience of the retail bottles to-go setup that makes up the Carrolton store. In addition, the Denton site will include a one-of-a-kind walk-up service window that is accessible from the street. 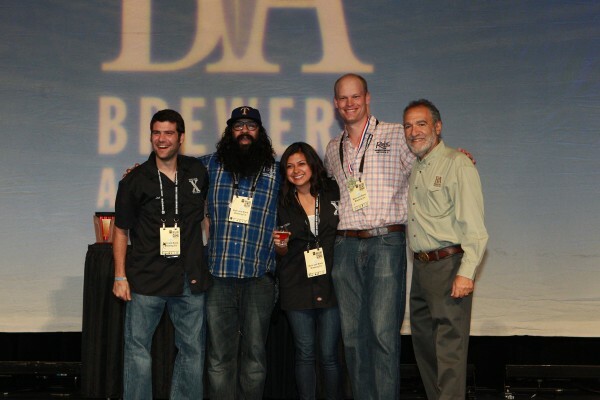 For the two founders, "Lone Star Taps & Caps continued growth is a result of their constant dedication to provide the ultimate craft beer experience to patrons." Combine this with a desire to continue providing the service and selection that has made them a staple in the craft beer community, and you have the makings of a mission statement that has remained strong and unchanged since they first entered the industry nearly a decade ago. And, indications are that this approach will endure well into the future, as Sam and Rick have every intention of opening more locations in surrounding cities in the near future. 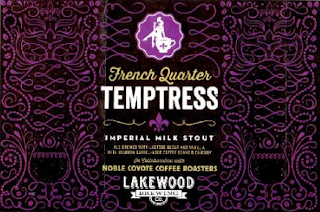 Sure to be welcome news for fans of the brewery's Seduction Series, Lakewood Brewing Company has announced the return of French Quarter Temptress. Once again, Lakewood will partner on the project with Kevin and Marta Sprague of Noble Coyote Coffee Roasters in East Dallas. For those that aren't familiar, French Quarter Temptress is created by infusing the brewery's imperial milk stout (a.k.a. The Temptress) with barrel-aged coffee and chicory in a process that seeks to capture "the spirit and attitude of New Orleans." French Quarter Temptress first appeared on the scene in late 2012 as a specialty firkin. Since then, the beer has been offered only on draft, however, with the 2015 edition it will be made available in 22-ounce bottles for the first time. As for whether or not consumers will notice a difference in this year's version, Lakewood founder Wim Bens explains that "every batch of French Quarter Temptress radiates a slightly unique taste and personality, yet the essence remains the same. We age the beans in our own Bourbon Barrel Temptress barrels before the coffee is brewed. The seductive flavor comes from the complex notes of bourbon in the beans, plus the spicy touch of chicory we add to the beer. It really is like New Orleans in a glass." According to a press release, bottles and kegs of French Quarter Temptress will begin appearing throughout the Dallas-Fort Worth Metroplex during the week of September 14. Check Lakewood's social media accounts (Facebook, Twitter) for updates on where the beer will be sold, or use the Beer Finder on the brewery's website to find a location near you.